October 11, 2016 – Hurricane, UT – Trail Hero wrapped up Saturday with a full day of trail rides, plus Bounty Hill and the Lasernut Rock Race followed by Closing Ceremonies in downtown Hurricane. The Lasernut Rock Race consisted of two heat races and a final main race. Heat races consisted of eight vehicles per race with the top four advancing to the main. The course was set at two miles in length within walking distance of the vendor show at Sand Hollow State Park so spectators could easily view the event. 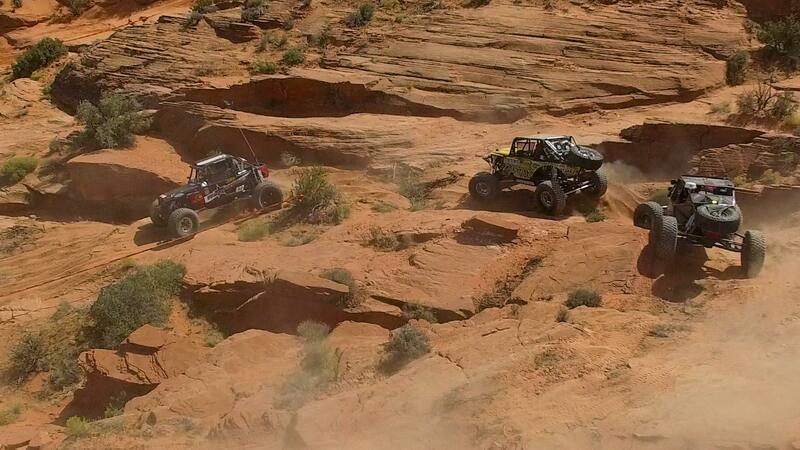 The course consisted of sand washes, rock obstacles and switchbacks. The first heat race Cody Waggoner and Rawlin McGhie dominated the race and lapped almost the entire field until Rawlin’s buggy lost the lower link mount taking him out of the race. Capt Rob Flandro and Greg Lundeen also had issues with their vehicles taking them out of the race. Cody Waggoner in his independent front and rear suspension buggy dominated heat one. Along with Cody advancing to the main, so did Chad Schoonover, Paul Kroger, and Greg Lundeen, however Greg’s computer was having issues and not allowing the buggy to run correctly and forfeited his position in the main. Chad Shoonover and Greg Lundeen working to stay ahead of Cody Waggoner in the first heat race. The heat two race contained great racing action between Dustin Sexton, Quinn Pultz, Ryan Miller and Wayne Hartwig. 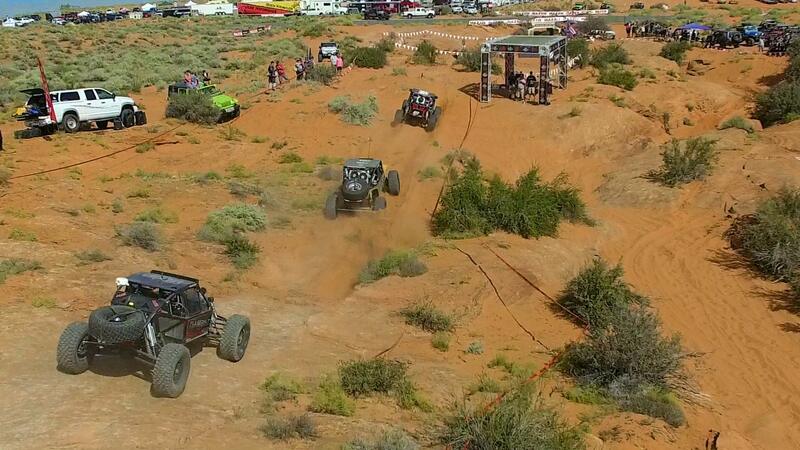 Several passes were made through out the race, with Dustin being chased by the rest of the pack. Racing was so tight between Dustin and Quinn that Quinn actually went for a pass in the rocks and drove over Dustin’s right rear tire. Unfortunately he wasn’t successful with the pass and continued to chase Dustin’s dust for the rest of the race. A Toyota truggy driven by Tyler Roundy was the only DNF in heat two racing as he came off an obstacle hard and pushed the engine through the radiator. The main race included top four finishers from each heat race and the remaining three vehicles that finished the most laps, as there were not enough competitors with running race vehicles to warrant a last chance qualifier into the main race. Racers in the main race were, in starting order, Cody Waggoner, Dustin Sexton, Chad Schoonover, Quinn Pultz, Paul Kroger, Ryan Miller, Wayne Hartwig, and Paul Tyler. Dustin Sexton tried to chase down Cody Waggoner for the lead and managed to snap the right front tie rod off at the steering arm on lap two through the rocks. Wayne Hartwig had a flat tire on lap three which slowed him to the point of being lap traffic. The flat tire took its toll on the buggy by lap five and he snapped his high steer arm in the same location that Dustin broke the tie rod. Paul Tyler pulled off course shortly after Wayne’s breakage. Quinn Pultz, Ryan Miller, Chad Schoonover and Paul Kroger continued to chase Cody around the track but nobody could catch him. Cody lapped all but Quinn and Ryan during the main race and took the checkered flag. Cody Waggoner wins the inaugural Lasernut Rock Race at Trail Hero with Quinn Pultz in second, Ryan Miller in third, Chad Schoonover in third, and Paul Kroger in fourth. DNF racers were Dustin Sexton, Wayne Hartwig and Paul Tyler. Cody Waggoner clubs out of the sand wash during the Lasernut Rock Race. Closing ceremonies for Trail Hero were Friday evening at the Hurricane Recreation Center in downtown Hurricane, 8 miles from Sand Hollow State Park. 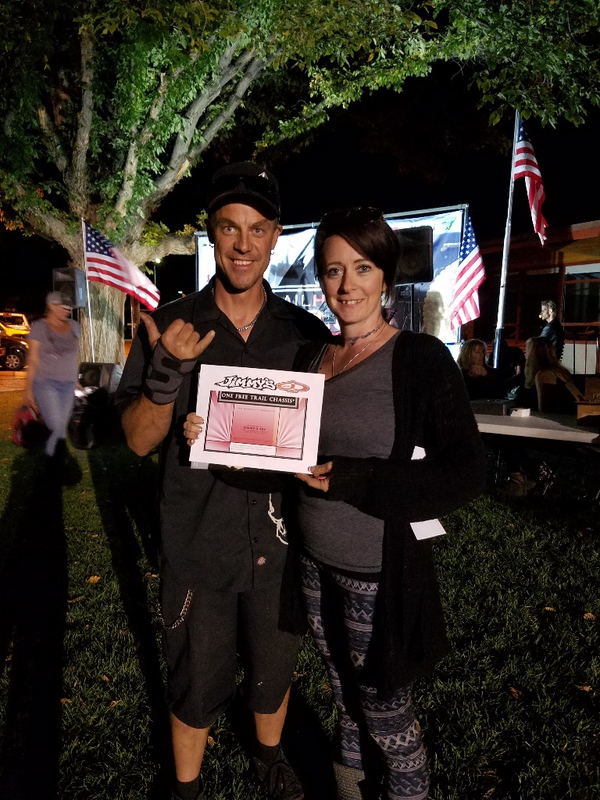 Awards were given out to the Maxxis Tire Night Rock Crawl winners, Lasernut Rock Race winners and thank you to our voulnteers and attendees of the inaugural Trail Hero event. Following the awards ceremony, the Utah Public Lands Alliance raffle was held and several people walked away with big prizes like Maxxis tires, a winch, and a Jimmy’s 4×4 chassis. The Lasernut Rock Race was within walking distance of the vendor show and drew a large crowd. 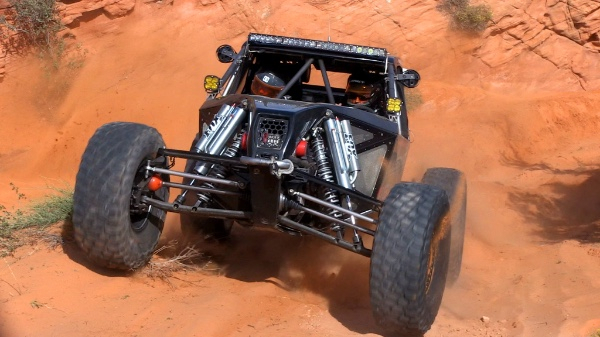 Shelly and George Leyner won the Jimmy’s 4×4 chassis in the Utah Public Lands Alliance raffle.